Our Giantex flower stand can fully play its multifunctional role inside or outside your home.Equipped with solid and weather-resistant wood construction, the plant stand can be placed at your balcony, living room, garden or patio etc. not only to display beautiful flowers and vigorous potted plant but also to store or exhibit your photos, trophies, books and other beautiful artworks. Multi-layer high and low design makes full of space to highlight all plants and makes them not affect with each other. Each rack provides sufficient space to accommodate plants, and hollow-out design make it convenient for you to water plants without messy. With strong bearing capacity, anti-corrosive and weather-resistant wood construction will maintain long term use. It will be an ideal choice for your home! In addition to serving as a flower rack, it can be used for displaying pictures, paintings, knickknacks, books and other artworks or ornaments. 【Practical Hollow-Out Design】: This flower plant shelf is characterized by its hollow-out racks which let you water plants without messy. It also provides ample room for natural growth of flowers or potted plant. Open high and low design enables your plants to fully enjoy sunshine and makes it convenient for you to reach or water them. 【Sturdy Wood Shelf Construction】: Our bonsai exhibition shelf is constructed of fir wood which is anti-corrosive and weather-resistant so that it can serve for long period. Its edges are smoothly processed to protect your hands from being scratched. All racks are assembled with high-quality hardware to ensure the stability and sturdiness of the entire stand. 【Powerful Bearing Capacity】: This plant stand is strong enough to withstand most bad weather. Each tier can hold max weight up to 25 lbs. Powerful weight capacity ensures safety of each plant. Each rack is wide and spacious enough to hold most pots. The special design makes it convenient for you to move or transport it. 【Multifunctional Display Shelf】: In addition to exhibiting bonsai or flower, the stand can also be used for displaying pictures, paintings, knickknacks and other artworks or ornaments. It can serve as a bookstand to store and display your books. 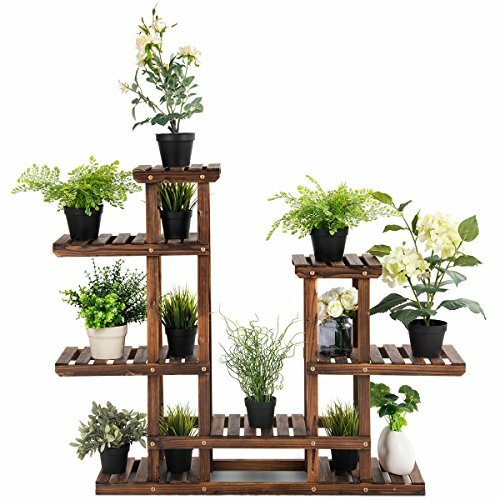 【Indoor & Outdoor Flower Rack】: The layout of this flower rack makes full use of its display and exhibition space and 7 wood shelves and scattered design enables flowers or other plants to fully show their beauty and charm. It is suitable for being placed at balcony, living room, patio, garden or terrace. Various flowers can be put on it such as succulent plants, narcissus, cactus, roses, lilies, tulips, daisies and so on. It can also serve as a beautiful artwork to decorate your place.